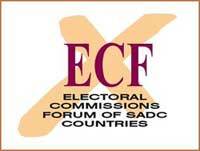 The Electoral Commissions Forum of Southern African Development Community (ECF) is an independent entity which facilitates co-operation between the electoral authorities of countries in the Southern African Development Community (SADC). Its main function is the promotion of democratic values and free, fair and transparent elections in SADC countries. The majority of the SADC countries currently enjoy relative political stability, which provides an ideal opportunity to promote democratic development in the region. Such development necessarily encompasses electoral processes that genuinely enable the participation of ordinary people in free and fair elections. Without effective and well-run elections, democratic transformation will not take place.